I didn't report this last weekend but it was the windy city baseball derby (pronounced off course derbee and not darby) series between the 'world champion' White Sox and the world chumps, the Cubs. The city rivalry goes back to 1900 but the two teams only met occasionally until the National and American League's decided to allow official 'interleague' games in 1997. Interleague play, better described here, opened up many big city hostilities such as New York Yankees v Mets, Los Angeles Angels v Dodgers and of course the Chicago Cubs v White Sox. The socioeconomics of the north side and the south side of Chicago are well known but in my experience the seperation of the old days doesn't exist anymore as most homes have fans of both teams around the dinner table. 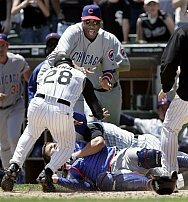 However these sentiments were not borne out on the field last weekend as a punch up involving most of the players followed a home plate collision between Sox's AJ Pierzynski and Cubs' Michael Barrett. 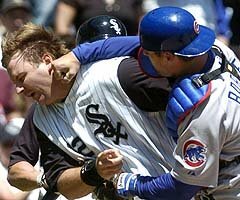 Chaos ensued much to the joy of a packed US Cellular Field, which led to four ejections and subsequent hefty fines and bans this week. The three game series was won by the White Sox 2-1.